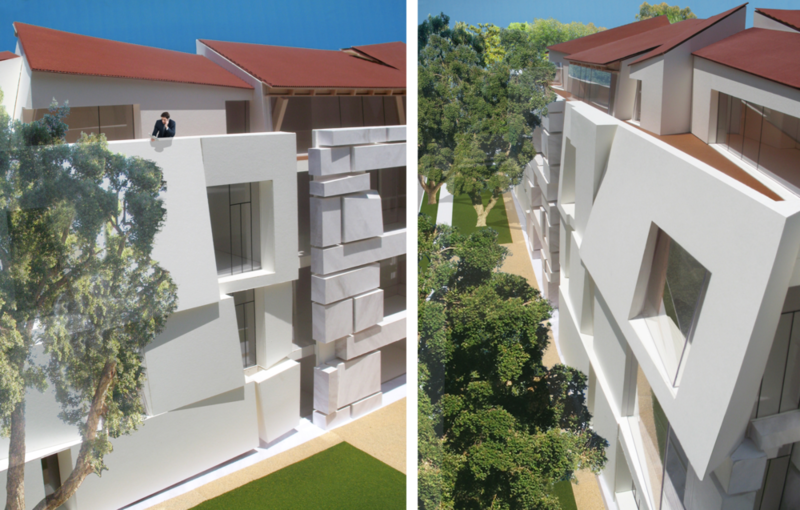 This four-story residential development proposed for a site in the heart of metropolitan Los Angeles offers an alternative to the single-family homes and towers that surround it. About 150 years ago technologies emerged that dramatically changed the way we live. Electricity, steel and the internal combustion engine made possible the very tall building and the automobile. This in turn made possible extremes in how we live: super dense places with lots of tall buildings such as New York and super spread out places like the suburbs and edge cities of California. The invention of steel and the automobile were disruptive technologies in that they made possible what had seemed previously impossible: very tall buildings and very spread out places in which to live. Manhattan, New York and Lakewood, California are examples of the application of disruptive technologies (steel and the automobile) in the extreme. Like any disruptive technology we were almost obligated to try them out, see them through, see what worked, just as we are equally obligated to confront what doesn’t. (Portable digital technology is after only a decade of ubiquity and seemingly endless possibility now gripped by self-doubt). Has the time not now arrived for us to evaluate what has and has not worked about the way we engage in making very tall and very spread out places? Los Angeles now challenged by a so-called “housing crisis” (meaning housing shortage) has yet to find its footing in how better to accommodate more people in a more judicious manner. Neighborhoods with lots of very tall buildings are intense places. They distort real estate values, the economics and quality of life. They create a kind of frenzy that only billionaires can psychically afford (or afford to escape). It takes a special person (born and bred, young, disenfranchised, rich or all of the above) to be a long-term Manhattanite. Those relatively few New Yorkers who inhabit Manhattan mostly do so for work, living mostly in the far less dense boroughs. This is a case of too much building on too little land. 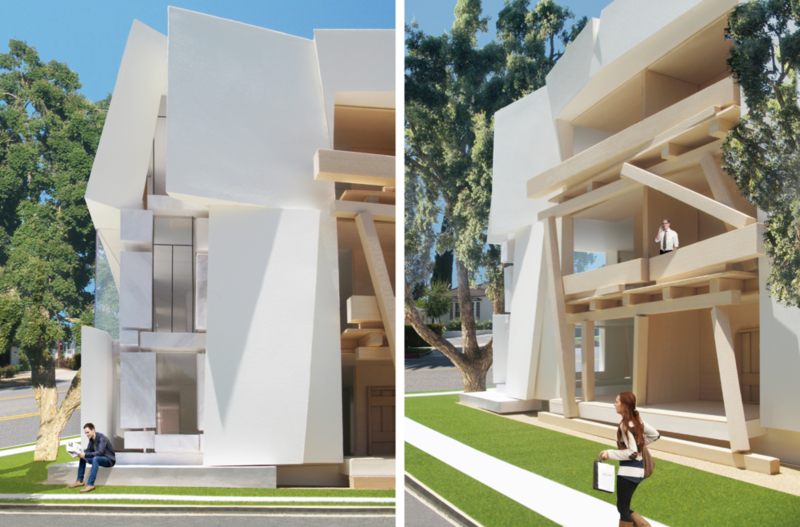 This four-story residential development proposed for a site in the heart of metropolitan Los Angeles provides 41 large homes on a little more than an acre, six times the density of a typical single family neighborhood. Neighborhoods where everything depends on our ability to get places in a car are disorienting and unnatural. Nothing has changed about the human body in the last 150 years that would necessitate such dependence on a machine. To have made it an irreplaceable necessity in every moment of daily life is a distortion of our natural selves. Large tracts of single family homes spread across once vacant hillsides are not only socially and physically unhealthy places to live but destructive. They require huge amounts of land movement and infrastructure—roads, power, water. That there are already many of these places under duress here in California despite the shortage of housing is testament to our inability to sustain such a way of life. In the language of sustainability a single family home is no better than a gasoline powered RV. For those who care about our future on the planet the choice not to live in a single-family home is way more effective than purchasing a hybrid or electrical vehicle. No matter how the automobile is powered we are still left with its dimensional problems—the space required to accommodate it. If there is a truly unrenewable resource available to us it would be land. And by all accounts this is a diminishing resource. This does not have to be a dilemma. Experience provides models for how to build not too tall or too spread out. For five thousand years prior to 150 years ago buildings made of stone and wood for the most part limited building heights to on average four stories. This happens also to be what most humans can reasonably navigate on foot via stairs. As one can see in any historic center of any city around the world four story buildings can be relatively tightly packed, still let in lots of sunshine, create coherent, beautiful environments and provide for most of our daily needs within walking distance. 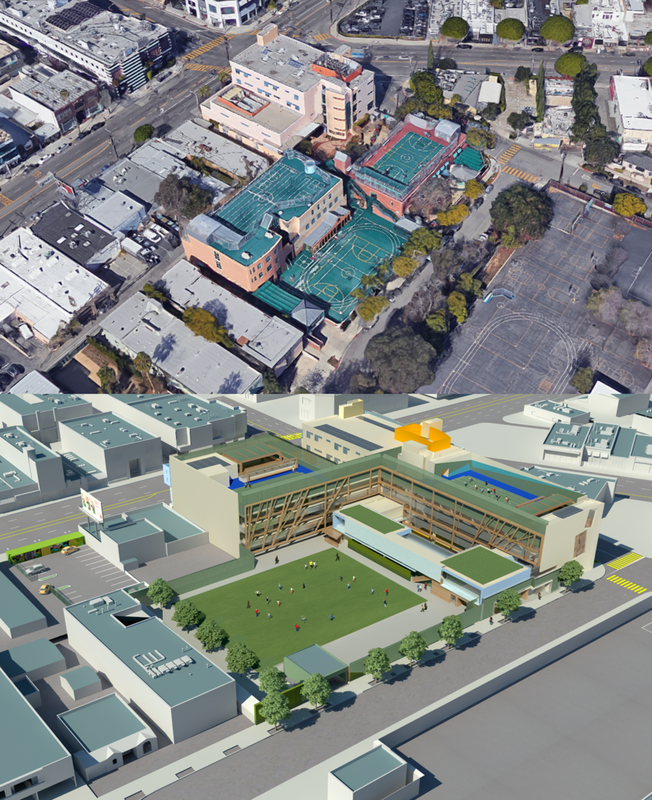 The typical school campus (left) accommodates half the number of students on twice the amount of land than what this West Hollywood school will occupy at conclusion of its redevelopment (right). This isn’t to say we shouldn’t build one-story or one-hundred-story buildings but rather that we should be more judicious in how and where we build them. Disruptive technologies provide new tools not toys with which we’re supposed to play indiscriminately. They make possible what seemed impossible—but crucially they are best applied to transform (for the better) the way we live not obliterate all that was good about the way we used to live. The wonderful tools that Thomas Edison (electricity), Henry Ford (automobile), Elisha Otis (elevator) and Andrew Carnegie (steel) introduced to the world will be with us forever. We should teach ourselves how better to use them. The key to greater density is generous, accessible open space.